Melbourne based company, Catalyst Design Group, has won the Australian Design Award of the Year for KNOG's newest light; The Gator, a high powered LED bike headlamp that is visually simple, compact and obnoxiously bright. The light comes in three models  105, 305 and 605  and can be ordered from Persons-Majestic at 800-772-2453. Stephanie Watson, Manager of Standards Australias Australian Design Awards said to win the Australian Design Award of the Year is to receive the highest national achievement of design excellence available to the Australian design industry. The Australian Design Awards provide a platform for companies to showcase an amazingly broad spectrum of manufactured product; ranging from the latest in Automotive designs such as (GMH's new SS Commodore range, to products in the consumer, Biomedical, sports, business and technology categories, even the humble clothes peg was redesigned. An international panel of judges used an exhausting evaluation process to choose winners for each of the eight (8) categories. At the end of the evening there is of course one overall winner - who's product is judged to be outstanding on every level. 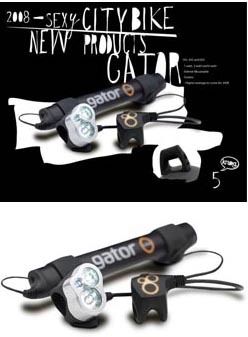 This year (2007) the overall winner was Catalyst Design Group for their design of the KNOG's new 605 Gator - a high powered cycling light. Catalyst's directors; Hugo Davidson and Malcolm McKechnie established Catalyst as a design consultancy back in 1993, and provide design services to companies all over the world. Their client list includes (amongst many others) NEC Japan, Sony, Cannondale, Scott, Giant, Motorola and Tait electronics. In 2003, Malcolm and Hugo decided to establish a range of cycling products under a brand KNOG. Since its inception, Catalyst have developed over 80 proprietary products under the KNOG brand. Established manufacturing partnerships with factories throughout China and now sell KNOG products through distributors in 30 countries. In those four short years, they have been awarded three (3) European IF awards, one (1) Red Dot award and two (2) Australian Design awards for this range of products alone. "Being awarded with The Australian Design Award 2007 is certainly a career highlight," said Davidson. said McKechnie. It uses the signature KNOG silicon fastening system to hold it steady on the bikes frame and handlebars. This system uses smart charge technology and High Capacity Lithium Ion Battery that charges in record time and lasts longer than competitive products. One of the most unique and impressive features of the Gator is its industrial design and unique style. The Body, molded in Diecast aluminum and overmolded with Cool Touch Silicon has a polished aluminum bezel. It is very rugged, yet remains the lightest product of its class. The material choice and attention to detail is obviously one reason the Gator was awarded the Australian Design Industrys highest honor. The Gator comes in 105, 305 and 605 models and retail for $199, $299 and $399, respectively. The Gator signifies an important step for the KNOG brand. KNOG's previous lighting products have all been very well received the world over, but they all sit in the sub $60 price bracket. Developing a serious range of lights using the latest technologies ensures that the KNOG brand is seen as an industry leader, offering premium products, not just Xmas stocking fillers. For additional information go to www.knogusa.com. For ordering, contact Persons-Majestic at 1-800-772-2453 or e-mail permaco@aol.com.